You read this and thought: “I want to tap into that. Can I get it for my company?“. The short answer is yes – and in this article I will show you exactly how. 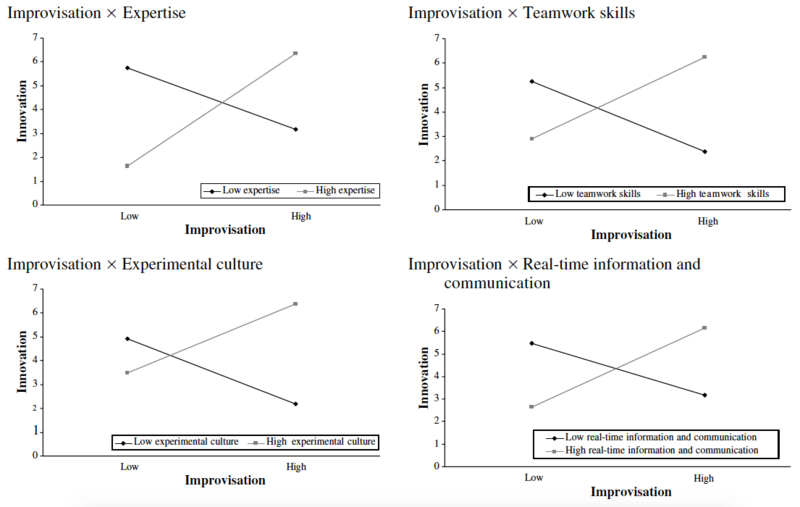 Improvisation, well taught, can boost innovation in companies but not in all of them. So let’s take a look at that first. There are certain conditions you need to have in place to get the boost you’re looking for. Without them applied improvisation may even damage your innovation potential. So, before anything, check if your company is right for Improvisation Training. If those four conditions are in place, then Improvisation Training can generate a positive effect on innovation (Vera and Crossan, 2005). If they are not in place, the effect of applied improvisation on innovation may be even reversed. Simply put: applied improv will push your innovation potential further if you are already innovation-oriented. If instead you are a static and uncommunicative company, applied improvisation training may even work against your innovation efforts. If you look at the net effects in terms of innovation, though, you are always better off having your four factors established and adding impro to them. 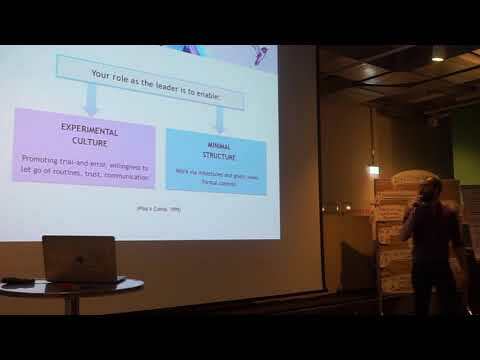 In other words you reach your highest innovation potential if you first work on your team’s expertise, teamwork, experimental culture and communication, and only then add impro to the mix. The good news is that impro can train two of those conditions as well: teamwork and communication. What does Improvisation do for Innovation exactly? If you have an innovative culture already in place, it mean you’re working with stuff like agile project management, design thinking, lean and so on. This is all great and it works, so where does impro come in? Improvisation comes in heavy right at the beginning, when you need to generate ideas; and more subtly later, anytime the team meet, talk and discuss. This still sounds very abstract, so let’s take an example. At the beginning of a project, you have an idea-generation phase. Call it brainstorming if you wish, even though I have a pet-peeve with that. We all know the rules: don’t censor anything, don’t judge, etc. and we’ve already used it. 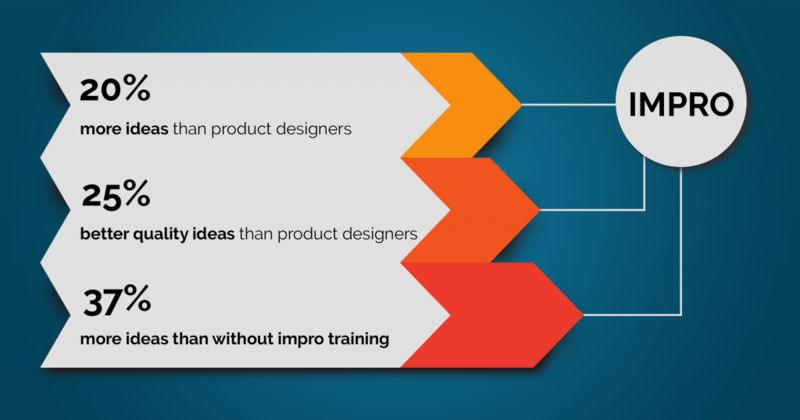 So, what would Impro Training do to your team with respect to brainstorming? Answer: a single impro workshop can cause a 37% increase in idea generation and output during brainstorming. (Kudrowitz, MIT, 2010). 25% better quality for product ideas than product designers. This is what Applied Improvisation does for Innovation – it gives you an advantage right at the start. How do I get improvisation in my company? It’s much, much easier than you’d think. The fact that improvisation is applied in big universities and companies makes it look like it’s in a sort of unaccessible ivory tower. Nothing father from the truth: there is abundance of trainers around the world, if you want to find one just look up your choices on the website of the Applied Improvisation Network (AIN). For example, for Berlin you’d find my AIN profile here. If you find nothing around you on the AIN’s website, don’t give up. There are a bunch of trainers that aren’t registered so feel free to explore around! If you want to do an innovation workshop, my take is the more the better but I understand you need to draw a line. You can get the basics with a one-day or even half-day training to be honest. The basic concepts are not rocket science – what is difficult is “getting it” and applying these concepts consistently every day. Start with a simple training and see what changes in your team dynamics, then decide what to do. 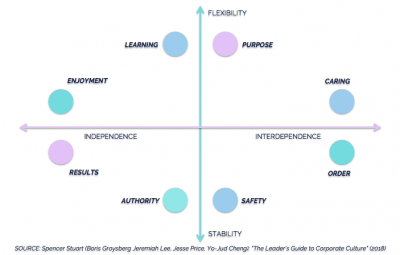 It might also be that Improvisation isn’t right for your team: it’s not the magic wand after all – but it’s definitely worth a try. have you received impro training in your company? How has it been? Would you recommend it? are you a practitioner and have been giving workshops in applied improvisation? Share your experience! What has or hasn’t worked? What’s the number one lesson you want to share? Let me know, I look forward to reading your comments!